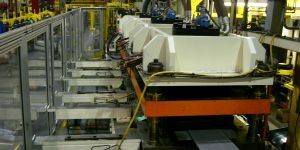 Metform has been supplying presses for roll forming lines for many decades. 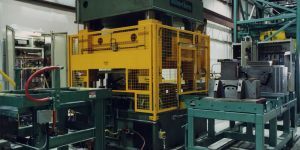 The Metform press is an industry standard and its legacy is durability. 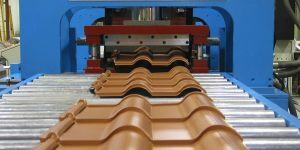 It is specifically designed for the roll form process. 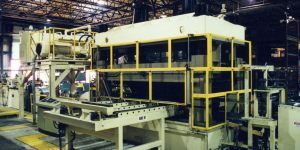 It is a fast acting press designed to keep up with higher roll forming strip speeds and the rigors of high volume production environments. Optional “wet” hydraulic clutch available. 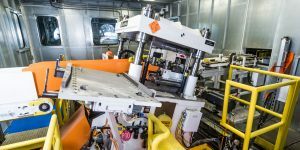 Metform also supplies hydraulic pre-punch presses up to 300 ton. 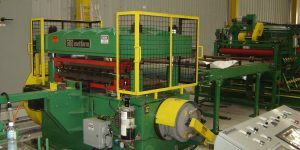 For cut-off applications specifically where longer strokes and horizontal cutting is required Metform supplies flying hydraulic cut-off systems. These include die platens for quick die change. These systems are necessary when there is significant blade engagement time during the cut. They are popular when cutting welded tube sections.